It really does pass in a flash. One minute you’re sitting there in your curlers, leisurely sipping your first champagne of the day, and the next you’re waving goodbye to everyone and the most wonderful day of your life is drawing to a close. You want to freeze time, or at least slow it down, so that you can savour every single moment. Others, may, however, experience the day a little differently. For whilst your near and dear may be thrilled to bits to witness your union and enthusiastically join in your celebrations, there is, it has to be said, a great deal of hanging around, waiting for the photos to be taken, food to be served and the room to be prepared for the evening party, during which time it is conceivable that a modicum of boredom might be felt. In addition to the marvelous choir which sang during our wedding ceremony (the subject of another post), we also hired the services of Nero, a string quartet, to play during our drinks reception at Compton Verney, as well as a gypsy jazz band called Gypsy Spirit to provide the evening entertainment. At the drinks reception, I had hoped to keep everyone entertained by arranging for Nero to play a variety of theme tunes from television programmes, past and present, so that our guests would have something to talk about if conversation ran dry. In the event, however, it wasn’t financially viable because it would have meant having to pay additional fees to Nero to learn lots of new pieces, as well as the cost of having each piece professionally rearranged for string instruments. Even Mrs Moore at her most profligate had to draw the line somewhere. We did, however, go through the whole of Nero’s extensive repertoire and chose exactly which pieces we wanted to be played and at what time. We also paid for a couple of new pieces to be included, one of which was the theme to Wallace and Gromit. An odd choice you might think, until I tell you that our first bona fida date was to see The Curse of the Were-Rabbit back in 2005. Fig.1. 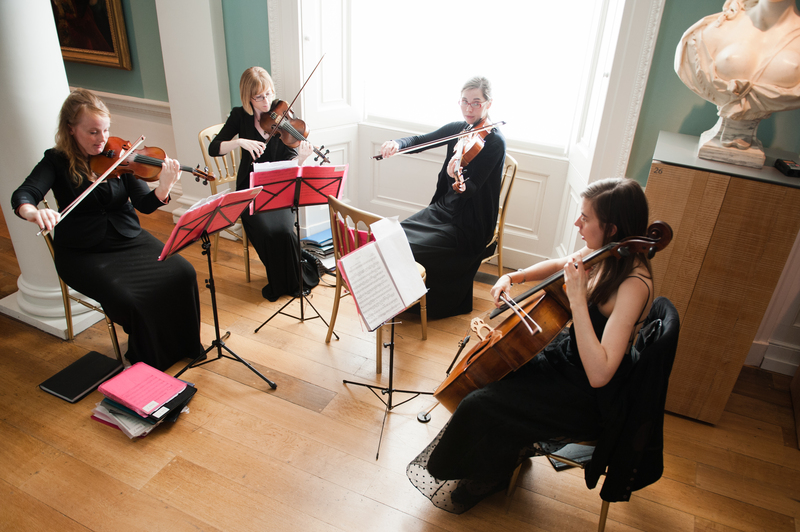 Nero, the Warwickshire based string quartet playing during our drinks reception at Compton Verney. Copyright Tony Rabin Photography. Drawing up the seating plan was no five-minute job. On the contrary, it took days of debate and deliberation as we tried to work out which of our guests shared common interests and would find something to talk about. 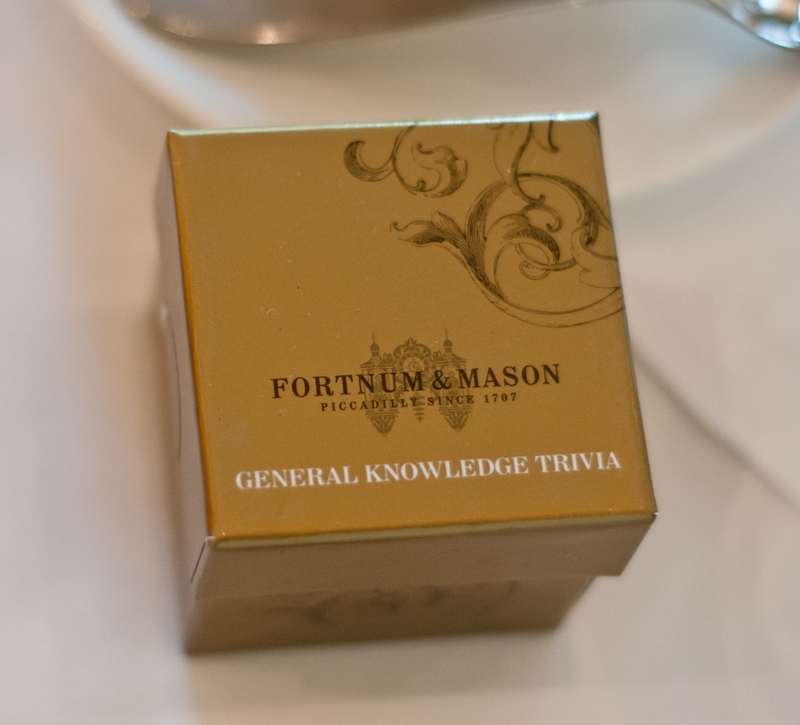 So in an effort to ensure that no one felt awkward or tongue-tied, we bought multiple boxes of table quizzes from Fortnum & Mason. To be honest, I don’t think that many of them were used but that’s only because everyone seemed to hit it off right from the start, so we’re not complaining. On the contrary, sitting at the top table and watching everyone talking and laughing together is one of the most precious memories I have of our wedding day. The warmth and conviviality that surrounded us really was more than we could ever have wished for. Fig.2. Table games courtesy of Fortnum & Mason. Copyright Tony Rabin Photography. Had money been no object, we would have liked to create an after dinner atmosphere akin to that seen in period dramas like Downton Abbey or Upstairs, Downstairs. Specifically, I was hankering after the antique billiards table I had seen for hire from Browns Antiques. 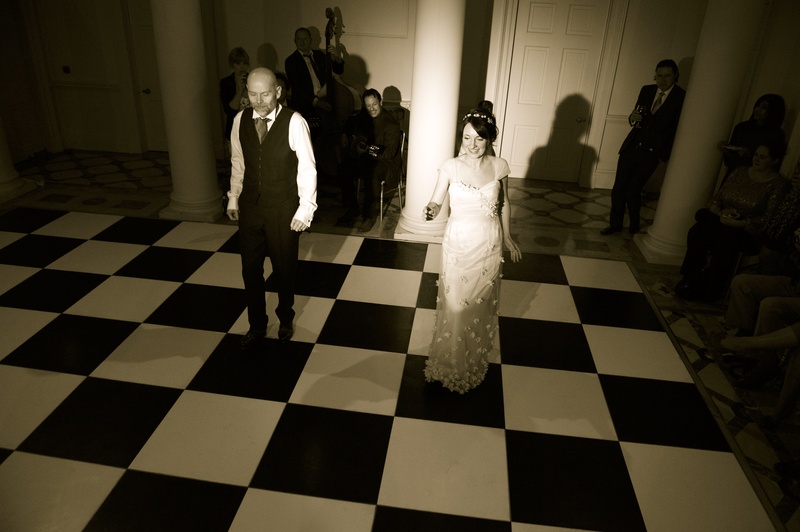 But pressure on the wedding budget was such that we settled instead for a somewhat more modest chess board from John Lewis and several packs of V&A playing cards which we arranged to be set-out in the bar area. Fig.3. 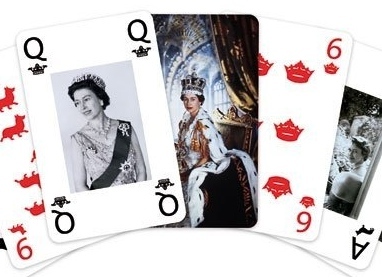 Diamond Jubilee themed playing cards from the V&A added a regal flavour to A Warwickshire Wedding. Such was our fear of ‘The First Dance’ that we seriously considered not having an evening reception at all. The prospect of having to shuffle through a slow song with everyone watching made us cringe. Analysing the root of our fear, I realised that it wasn’t because we were embarrassed at the prospect of being watched per se, but rather that we wouldn’t know what to do and might just end up clinging to one another, marooned in the middle of the room. So, I reasoned, one way to overcome this toe-curling scenario would be to learn a dance in advance with set steps. Given our complete inability to master even the most basic waltz, some kind of ‘Strictly‘ routine was out of the question. But then John hit on a great idea: a tap dance to Puttin’ on the Ritz, which was one of the numbers on Gypsy Spirit’s playlist. 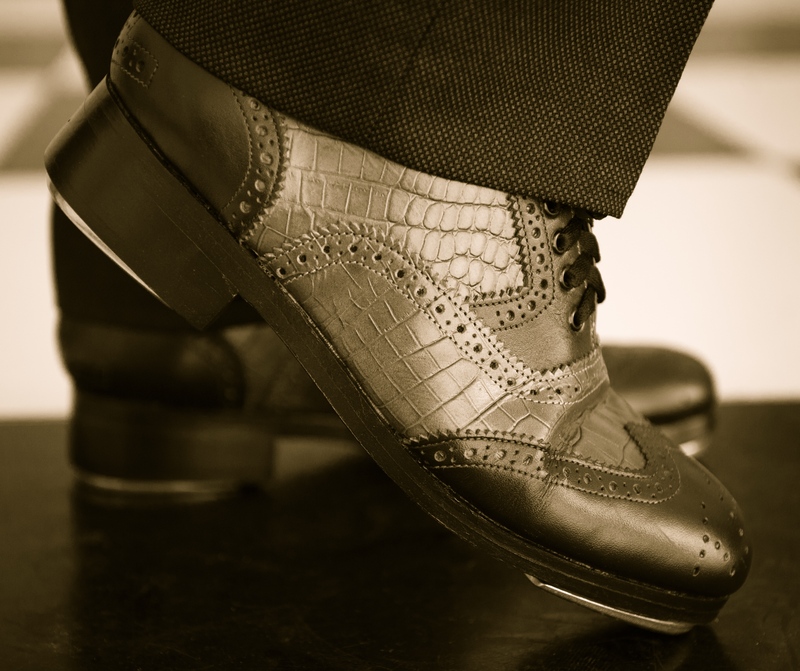 To be honest, I think it was just a throw-away comment but once he’d planted that seed of an idea in my head, it started to take root and, before you could say Fred Astaire and Ginger Rogers, I’d ordered a pair of tap shoes and asked my friend and ballet teacher, Miss Michelle, to choreograph a routine. Fig.4. My very own Fred Astaire. Copyright Tony Rabin Photography. Fig.5. 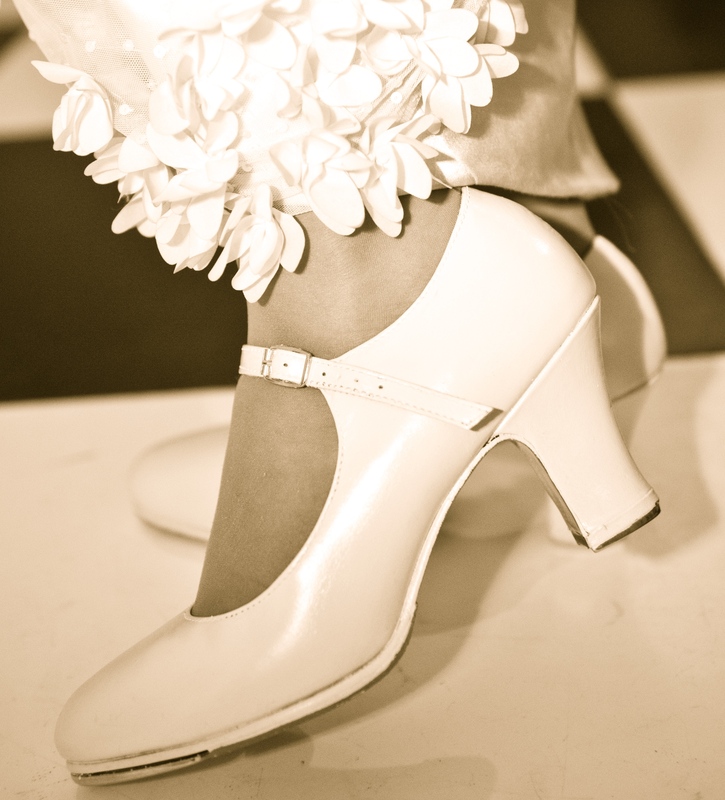 I couldn’t remember the steps but the tap shoes looked good. Copyright Tony Rabin Photography. Thanks to her patience and encouragement, it successfully blossomed into a fully fledged first dance. We were far from perfect, and I was completely thrown off course when the band added an extra verse, but I still think that it was preferable to the spectre of us swaying, red-faced, in the room. Fig.6. Puttin’ on the Ritz! 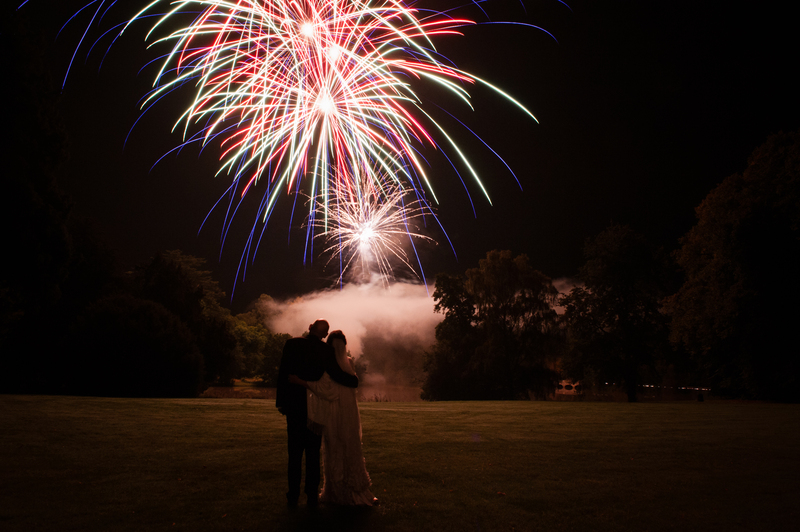 Given that we met in a pub called The Shooting Star, it seemed entirely fitting that a firework finale should mark the end of our nuptial celebrations. Indeed, if you’ll forgive the pun, one could even go so far as to say that it was, like our marriage, written in the stars. Fig.7. Fireworks over the lake at Compton Verney.